NEW YORK, N.Y. --- Fans of the long-running NBC sitcom Friends were delighted at NBC's announcement this week that a rumored reunion episode would finally materialize next month. In order to get all of the cast in the same room for select scenes, filming will take place on the campus of La Sierra University, close to some of the stars' homes in the Hollywood hills. The Friends reunion is part of a tribute to veteran sitcom director James Burrows who has shot 1,000 sitcom episodes, including many for Friends. 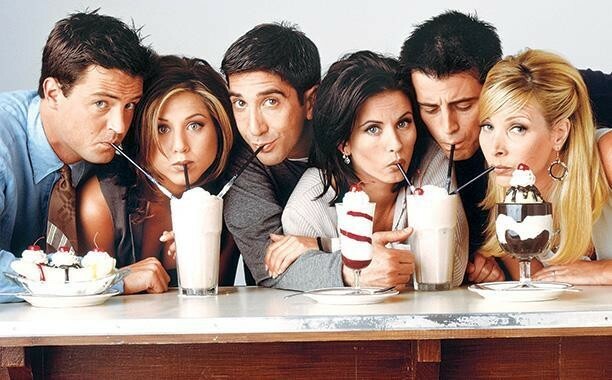 Although logistical problems have prevented a Friends reunion in the past, the proximity of the La Sierra shoot smoothed the way for David Schwimmer, Jennifer Aniston, Matthew Perry, Courteney Cox, Matt LeBlanc and Lisa Kudrow to sign on. "We are honored to be chosen as the filming location for the upcoming 2-hour NBC Friends special," said La Sierra spokesperson Pura Mentira to entertainment reporters at a press conference. "A lot of our faculty and staff are super excited about it." Although La Sierra students seemed generally enthused about a sitcom being filmed on campus, reporters noted that the average freshman response to the news about the Friends reunion was, "What's that?" That’s a good name for the La Sierra spokesperson, “Pura Mentira” (“pure lie”). It’s funny that they would choose La Sierra to entice the cast to reunite. Isn’t UCLA closer to Hollywood? Rather than Friends, I would like to see a reunion of the cast of The Three Stooges. It was a wise decision. I would join any reunion at La Sierra, what with their pretty co-eds and nice weather. I could even learn how people came from monkeys. You should always go to your friends’ funerals, or they won’t come to yours. They should get the cast of stars to record a song while they’re at La Sierra. How about “We Have this Hope” (a song about how they hope an earthquake won’t destroy Hollywood). I’d like to see a reunion of the Addams Family at La Sierra U. Even if some of the cast members are dead, they could still attend. Sevvy is such a good fiction writer. I wish I could hire him to write my campaign commercials. Why did the chicken cross the road? Because he was running for President. Why is BarelyAdventist always talking about La Sierra? Because the school is barely Adventist. The real reason for having the reunion there, is so they can rub shoulders with one of the students, Kylie Jenner. “What is this?” is right! Are we talkin’ bout Little Friend kids’ magazine? I’m outta the loop on this one. I mean, Woe iz me!! Yeah, you’re out of the loop because Friends was a show on the evil “satan box,” which SDAs don’t watch–and real SDAs don’t have one in their home.